Every year, I swear that I'm going to document the fermentation step by step. And every year, that goal eludes me. This year is no different, friends. The 2010 West Coast harvest was delayed for several weeks due to cold weather that prevented the grapes from ripening. The weather finally warmed up in early October only to result in 1-2 weeks of >100°F temperatures that resulted in flash ripening and grape dehydration. I lost a chance at making some Suisan Valley carignan because the abrupt heat wave rendered the crop unharvestable--turns out this is probably not a bad thing for the sanity of the winemaker at Aaronap Cellars. It also turned out that my splitting the harvest between California and Washington was probably the best darn thing that I could have done as WA was cool, but didn't experience the intense heat wave in early October. While the grapes were riding the temperature swings on the West Coast, I was busy staying on top of my viticulture class and trying to survive the pressure pot at work. Sad to say, but there were times when I felt like the grapes were adding to the stress instead of being my salvation. But the day finally arrived when I got the notice that my WA grapes were arriving--at the same time as the Amador County Zinfandel. Woo hoo! One trip to M&M! On Friday, Oct 25, I headed south to pick up the grapes. Really enjoyed that trip because I was the only one on the dock that morning and got to meet and chat with Frank Musto, the man behind M&M Winegrape. Really nice guy--very glad I finally had a chance to meet him. It took awhile to load 1500 lbs of grapes and frozen must. The only hiccup in the whole order was that M&M had inadvertently mixed my lemberger grapes in with the extras that were being crushed and frozen. Although I had wanted to make a white lemberger, no biggee. More red wine and less crushing work. Not a bad trade off. But back to the grapes--yeah, you read right. 1500 lbs in total. 400 lbs (or so) of Two Mountains Winery lemberger, Yakima Valley, WA (7 5 gal buckets of frozen must which was a little more than the 324 lbs that I had ordered). That's my winemaking Joanne who was there to pick up her merlot grape order and help me crush. I was very thankful for her help because crushing 1200 lbs of grapes is a LOT of work. With her help, we were able to finish in about 3.5 hrs. That let me get most of the cleaning done before midnight. Here's a couple of shots of me happy as a clam... "A crushing we shall go, a crushing we shall go!" The grapes were really in quite nice condition. A little extra MOG (material other than grapes) that I would have liked in the WA grapes, but still very nice small berries. The zinfandel was pretty well raisined, but that's too be expected from zinfandel and what gives it the dark jammy notes. 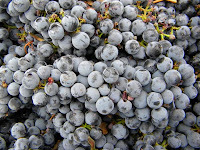 My only complaint was that the WA grape crates often had some dirt stuck in the crannies that fell into the crusher every so often as I was dumping--little extra terroir flavor, I guess. Now the late harvest meant that it had turned a little cool in Massachusetts by the end of October. Given it was about 10:00 PM by the time I wrapped up cleaning and started to think about must analysis, I decided to just let the must sit overnight. The grapes were still cold from the cold storage facility at M&M and the garage was not going to get over 50 °F that night. Not an official cold soak, but a cool rehydration. At this point, it was almost midnight, so I headed off to the shower and a warm bed. As far as documenting the fermentation step by step, I understand how difficult it is. You get so wrapped up in doing it, you forget to document it. Good job recapping though! Do you normally do this much at one time? This was the first year for me doing large batches, and its a lot of work.